Arab nations on Saturday endorsed indirect peace talks between the Palestinians and Israelis, a move that likely paves the way for the start of long-stalled U.S.-brokered negotiations. The United States has proposed the talks to end the impasse between Israelis and Palestinians over the conditions for resuming negotiations, which broke down more than a year ago amid Israel's military offensive in the Gaza Strip. 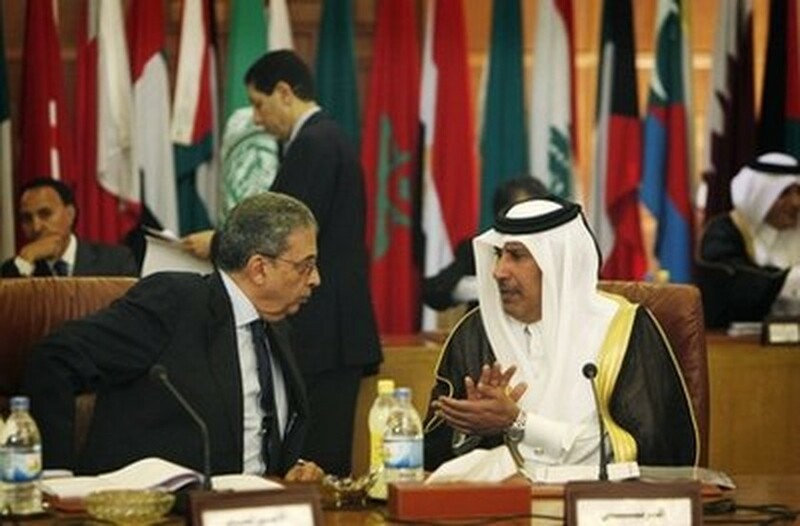 Arab League Secretary General Amr Moussa, left talks with Qatari Prime Minister Sheikh Hamad bin Jassem al-Thani during an Arab League foreign ministers meeting at the Arab League headquarters in Cairo, Egypt Saturday, May 1, 2010. The green light from Arab foreign ministers comes after a first attempt to get indirect talks going collapsed in March when Israel announced a new Jewish housing project in east Jerusalem. The Israeli decision enraged Palestinians, who claim east Jerusalem as a future capital, and drew fierce criticism from the United States. It also led to the worst rift in years between the U.S. and Israel, Washington's closest Mideast ally. Palestinian President Mahmoud Abbas has signaled that he is willing to resume negotiations, but has been waiting for approval from Arab countries, which would provide Abbas the political cover he needs to return to talks. Arab League chief, Amr Moussa, stressed Saturday that the league would be keeping a close eye on the talks, and said there will be no transition from indirect to direct negotiations. Arabs want a total freeze in settlement building before returning to direct talks. This is the second time Arab states have backed indirect negotiations with Israel; the first time was in early March. The Arab foreign ministers expressed reservations Saturday about backing the talks again, and warned that peace efforts would collapse if Israel continued to build settlements in east Jerusalem and the West Bank. They also said they wouldn't endorse an extension on the four-month window they originally gave the talks in March, a decision that leaves the U.S. only two months to make headway in the shuttle negotiations. Syria and Lebanon rejected the decision, saying the U.S. had not provided adequate safeguards needed to renew negotiations. Palestinian President Mahmoud Abbas told reporters Saturday in Shanghai, China, that the Palestinians' executive committee will meet soon to make a final decision on resuming talks. He also confirmed reports that he will visit Washington later this month for talks with U.S. officials "to push the peace process forward." On Friday, U.S. Secretary of State Hillary Rodham Clinton said the talks would start next week, and U.S. Mideast envoy George Mitchell is expected back in the region soon. The negotiations will not be the face-to-face meetings the Obama administration had hoped to put in place more than a year after peace efforts broke down amid Israel's military offensive on Hamas-ruled Gaza. The Palestinians have refused to sit down at the same table with Israel until it agrees to freeze all construction in West Bank settlements and in east Jerusalem — two areas that the Palestinians want for an independent state along with the Gaza Strip. The indirect talks, with Mitchell shuttling between the two sides, were meant as a compromise. Palestinian legislator Hanan Ashrawi cautioned that the Palestinians would still be waiting to see stronger Israeli compromises on settlement construction. "If it is to succeed then there are requirements that have to be fulfilled in order to give Mitchell's shuttle diplomacy ... some credibility and substance," she said. "Of course we need to see on the ground that Israel has stopped settlement activities in Jerusalem, around Jerusalem and everywhere else."